How do I track PAYG withholding amount for ABN non-quoted vendors? And, how do I calculate the Box W4 for BAS report? Navigate to the Bills module. Select the required bill and click on the Record Payment button. 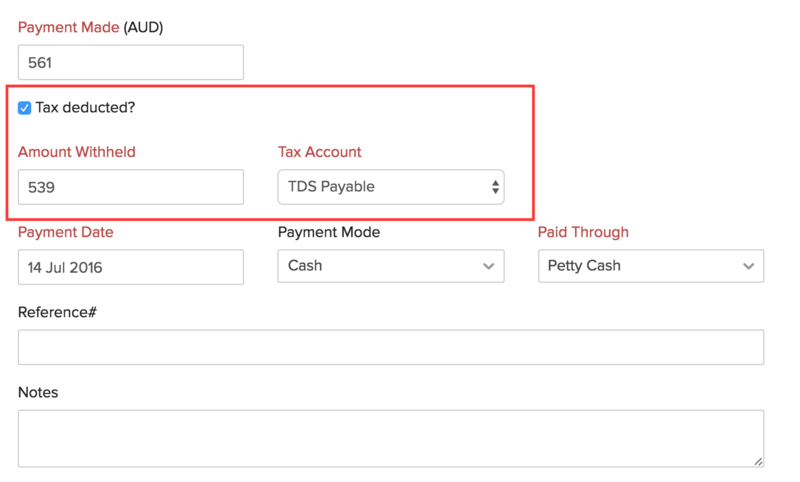 In the screen that follows, click the checkbox against Tax Deducted? and enter the amount in the Amount Withheld field. Finally, click on Save to record the payment after withholding the tax amount. Now, go to the Reports module and select Tax Withheld Summary report under the Taxes section, to view the PAYG withholding amount. Note: The value for Box W4 in your BAS Report, will be the total of the Tax Withheld Summary report of the financial year.